Spring Break was last week and I wanted to do something special with Tristyn. She has never really been to Chicago and it was high time we go. Except there was a two hour wait just to get in to the place! 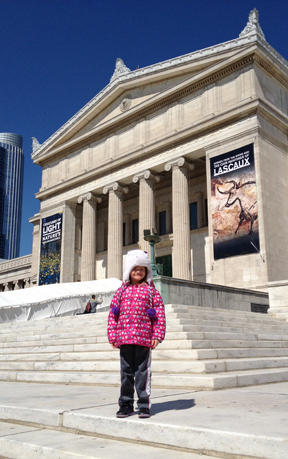 Tristyn in front of the Field Museum. She asked me what was at the Field and I told her dinosaur bones. I haven't been there since high school and a lot has changed. We have been reading the Magic Treehouse Books...we are on #12. Everything we saw at the museum related to what we had read! Dinosaurs, saber toothed cats, mammoths, mummies and cave paintings...it was awesome! Tristyn and Sue the T-Rex. I had never seen Sue the dinosaur. She was actually discovered by a woman named Sue who went to my high school! Collecting corn in a pueblo. We covered the entire museum and we were pooped! Tristyn is like a sponge and soaked up everything. Her favorite part was Sue and the 3-D movie. Tristyn found a $20 bill on the floor! We asked around and Tristyn ended up keeping it! She bought a stuffed horse to remember her trip. She said that it reminded her of the horse that was sketched in the stone in the cave exhibit. Grabbing a hot dog before the ride home. She had to go potty. No bathrooms in the parking garage. Museum was about to close. Into the museum and to the nearest bathroom. It closed 10 minutes before the museum closed. Down the stairs we go and down a long hallway. We throw everything on the floor and she flies on the toilet. Then she hears the announcement about the museum being closed. She freaks out because she thinks we are going to be locked inside. And her little tummy was still upset. I got on Lake Shore Drive and she was passed out. Passed out before I even got on Lake Shore Drive. By the time we got back to Hobart, she was ok.
We got our hair done for Easter and had Subway for dinner. I had a great time hanging out together and I know she did too! I can't wait to take her to the Science and Industry and the Shedd one day!